OTTAWA - Sheila Fraser, the former auditor general who became a virtual folk hero for exposing the sponsorship scandal, is training her sights on what she sees as a new abuse by the federal government: its controversial overhaul of Canada's election laws. Fraser, who co-chairs an advisory board created by chief electoral officer Marc Mayrand last fall, told The Canadian Press she believes Bill C-23, if allowed to pass without significant amendments, would constitute an attack on Canada's democracy. Among other things, the proposed legislation would disenfranchise thousands of voters, undercut the independence of the chief electoral watchdog, impede investigations into wrongdoing, give a financial advantage to rich, established parties and undermine Canadians' faith in the electoral system, she said. And she urged Canadians to speak up against the sweeping bill. "Elections are the base of our democracy and if we do not have truly a fair electoral process and one that can be managed well by a truly independent body, it really is an attack on our democracy and we should all be concerned about that," Fraser said in an interview. "When you look at the people who may not be able to vote, when you look at the limitations that are being put on the chief electoral officer, when you see the difficulties, just the operational difficulties that are going to be created in all this, I think it's going to be very difficult to have a fair, a truly fair, election." After publication of her remarks, the NDP requested that Fraser be invited to testify next week before the House of Commons committee studying the bill. The party's democratic reform critic, Craig Scott, expressed hope that such strong words from such a highly respected figure will be a "tipping point" that finally forces the government to back down. But the Harper government has so far been impervious to the near-universal condemnation of the bill by federal and provincial elections watchdogs, academics and electoral experts at home and abroad. On Wednesday, Democratic Reform Minister Pierre Poilievre said the bill is "terrific" just the way it is. Other Conservatives brushed off critics as ill-informed, resistant to change or downright hysterical. Asked repeatedly Thursday about Fraser's intervention, Poilievre did not specifically address the former auditor general's concerns or even mention her name. Rather, he appeared to suggest she's simply parrotting Elections Canada's point of view. "We have already said that we were aware of Elections Canada's positions on these issues. We just happen to disagree," he told the Commons. But Prime Minister Stephen Harper may find it harder to shrug off Fraser's scathing critique. As Opposition leader, he was one of her most ardent fans 10 years ago when she concluded that civil servants "broke just about every rule in the book" in administering the Chretien government's sponsorship program. 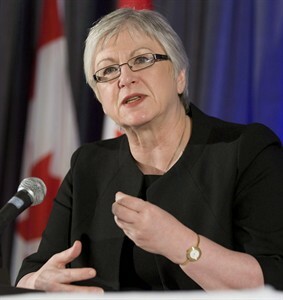 "Her competence and her courage have shone a bright light on the mismanagement, incompetence and corruption that this Liberal government has been trying to hide for more than a decade," Harper said in a 2004 speech, referring to Fraser as "the mother of all accountants" and praising her for not pulling any punches. "(She) did not say that she thought that something smelled fishy. She identified the fish." Fraser was equally blunt about the fishy smell she believes is emanating from the so-called Fair Elections Act. She said it appears to be motivated by a desire to rein in Elections Canada, which has been a thorn in the side of the Conservatives. The independent agency nailed the Conservative party for the illegal in-and-out scheme used to exceed its spending limit in the 2006 election; exposed illegal over-spending by former cabinet minister Peter Penashue; has charged Harper's one-time parliamentary secretary Dean Del Mastro with filing a false campaign return and failing to report campaign expenses; and is still investigating complaints about robocalls that misdirected primarily non-Conservative voters to the wrong polling stations in the 2011 election. Fraser pointed to the bill's proposal to hive off the elections commissioner, who investigates alleged wrongdoing, from Elections Canada, thereby separating the regulation and enforcement functions of the agency and making it more difficult for investigators to tap the expertise of elections officials. She also noted that the bill fails to give the commissioner the power to compel witness testimony. "Those provisions say to me that this is really a bit of an attack on Elections Canada and I find that really unfortunate because I really do believe Mr. Mayrand has done his job with great integrity, has certainly not shown the bias that some would like to claim he has and I just think it's really terrible the way he's been treated by government." As a former independent officer of Parliament, Fraser is particularly troubled by the limitations the bill would impose on the chief electoral officer's independence. Among other things, it would prohibit him from communicating with Canadians on anything but the mechanics of how, when and where to vote and it would prohibit the elections commissioner from talking about investigations. "Independent officers of Parliament and the government is now restricting what they can say? It's just so inappropriate," she said. The bill would also require the chief electoral officer to seek prior Treasury Board approval to enter into contracts with people with specialized or technical knowledge — including the advisory board which Fraser now co-chairs. "It's just offensive that the chief electoral officer can not have an advisory group without having to get approval from ministers. It's just astounding to me." Not only that, she said it could create "operational headaches" if Elections Canada must get prior approval to hire the thousands of temporary specialists and elections officials needed to run an election. It's crucial to the credibility of Elections Canada that the chief electoral officer have the independence to say and do what he feels necessary to ensure the integrity of the electoral system, Fraser argued. "Not only for Elections Canada but for all the agents of Parliament, the credibility of what these agents do is really based upon their independence and that they are viewed by the public as being objective, that they base their rulings, opinions, whatever they may do based on fact, that they run, in the case of Elections Canada, a fair elections process. "And if that independence from government is attacked or is viewed as not being there, I really think those institutions lose the credibility and the respect that they have from the public. And then if people start to doubt about the elections process, where does that leave us in this country?" The former auditor general is also troubled by a provision that would allow political parties to exempt from their campaign spending limits any money spent to raise funds from people who've donated at least $20 over the previous five years. She said that amounts to a giant loophole that would allow well-established parties to spend untold millions more during campaigns but would be "unfair" to new parties, which have no history of past donors. Moreover, she questioned how pitches for donations can be distinguished from pitches for voter support and how Elections Canada could monitor and verify that the exemption was not being abused. She noted that the bill does not give the agency the power to audit party books or demand to see their records, invoices or receipts — a power successive chief electoral officers have long sought. "There's such a fuss being made about lunch money and what (politicians) spend for travel and (yet) the political parties get more than $30 million (in rebates and tax credits) and there's no real accounting back," Fraser said. "In this era when everybody's talking about increased transparency and accountability, why would they not be subject to some kind of audit?" NDP Leader Tom Mulcair said Fraser's critique proves what his party has said from the outset: that the bill is aimed at "stacking the deck in favour of the Conservatives." Nevertheless, he said he's "puzzled" by Poilievre's refusal to acknowledge any problems with it. "It's almost as if the minister is delusional," Mulcair said. "He keeps affirming that everything's fine with his bill but every single expert in Canada, no matter whose side they're on, has come out and said this is an undemocratic bill."